Built in 1372 and recently renovated, Wat Phnom, meaning 'temple on the hill', is one of the most important pagodas in Phnom Penh. Situated on top of an artificial hill, at 27 metres, Phnom Penh is the highest land in the city. Literally, the name of the capital, Phnom Penh means Penh's Hill. 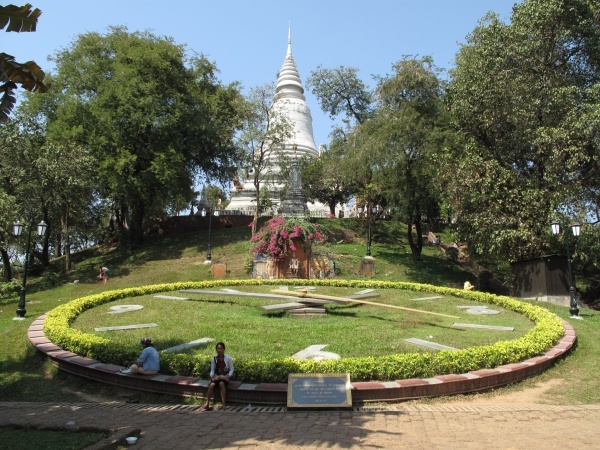 The pagoda was originally financed by a wealthy widow named Daun Chi Penh. The combination of the site for the temple and its financier provided Cambodia's capital its name. According to Khmer folklore, during the mid-fourteenth century, Penh lived on high land on the west bank of the river. During the rainy season there was a great flod in Laos, which caused much damage, uprooting many trees, which floated down to Cambodia. One of these trees came to rest on the banks of the river. When lady Penh and some curious villagers pulled the tree out of the water, they discovered four bronze and one stone sculpture of Buddha in a hole of its trunk. A small wooden temple was built on the hill to house the sculptures. 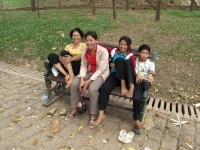 The hill was at that time called "Phnom Doun Penh" which literally means, "Hill of an old lady named Penh". In 1434, the old capital was moved from Angkor to the present day Phnom Penh. Many small buildings and palaces were built and the temple was rebuilt. Behind the temple was a large burial chamber where lions were kept as guards, near the staircase. Wat Phnom today has a shrine built on top of the hill, which is open to visitors. 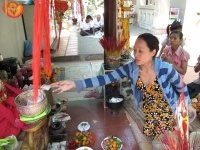 The hill is a busy site as the temple is active and draws local as well as foreign crowds. 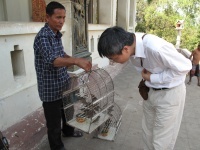 Peddlers offer visitors birds outside the pagoda as Cambodians consider it good karma to buy the birds and release them back into the wild. Fortune tellers, offer tarot card, palm and face reading while picnickers and office workers relaxing during lunchtime mingle with tourists and religious worshippers in the surrounding park. There is also an elephant offering visitors a ride around the hill. Entrance to Wat Phnom for foreign visitors is US$ 1 p/person. This page was last modified on 16 May 2011, at 07:37.